Students at Tassajara Zen Center have completed wildland fire training, so they can protect the Monastery. The Tassajara Zen Center has always had a fire crew, but ramped up training in 2014. Veteran firefighter and Zen student Joe Rawitzer leads the fire crew at Tassajara. The entrance to the Tassajara Zen Center. Fire hose has been laid strategically throughout the 10 acre property in preparation for the Soberanes Fire's arrival. The student dining room at Tassajara is now a staging area for fire equipment. A helicopter flies in to test out Tassajara's new landing pad. 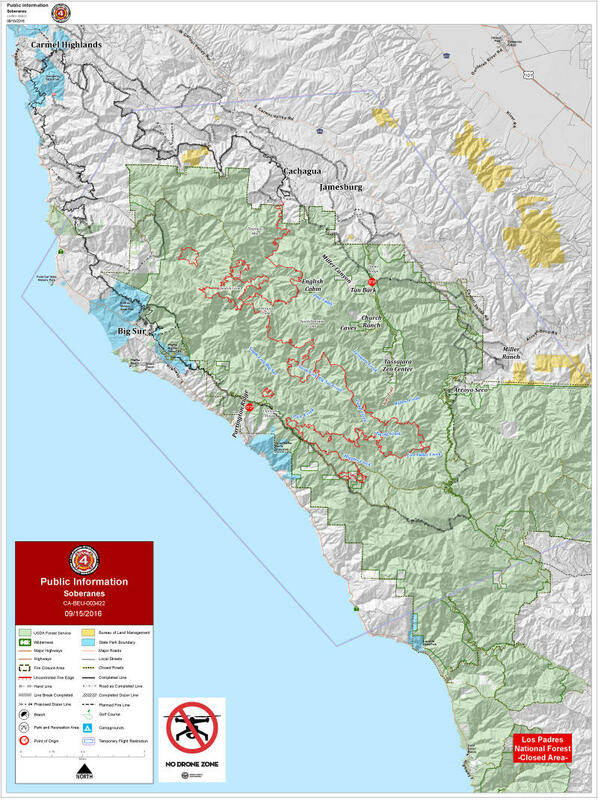 The Soberanes Fire is slowly moving closer to the Tassajara Zen Mountain Center, east of Big Sur. It's the first Buddhist Monastery built in the West. The fire is about four miles away. When and if the fire gets there, students and teachers who practice at the center plan to be the ones fighting it. That’s because they’re unlikely to get much outside support. The Zen Center is at the end of a 14-mile dirt road. It’s so rocky and rugged that it takes one hour to complete the drive. At the dead end, an open wooden door frames the pathway into this Monastery. Normally it’s a place of quiet, spiritual meditation. But lately the peace and tranquility in this valley has been broken by the buzz of water pumps and helicopters. The Center added a new helicopter landing pad on a ridge above the ten acre property. It’s ready for medical evacuations or other emergencies. It’s just one way they’re preparing for the Soberanes Fire. They also cut back trees and removed brush. And they’ve upgraded the rooftop sprinkler system on some of its 50 buildings. “We’re preparing for the fire coming. When it gets this far and this close, it does come,” says Linda Galijan, Director of Tassajara. The area between the fire’s closest point and the Zen Center is so rugged that the only firefighters in there are from a hand crew. The Alaska Team sent in the crew to cut a fire line on a ridge above the center. But it’s unlikely they will stick around if the fire gets here. So it’s up to the staff and the students who practice here to defend this sacred space. “Right now they are training,” says Galijan. Dressed in fire protective clothing, the students are spending their days testing water pumps, rolling out hose and running through fire scenarios. Galijan says they all have completed formal wildland fire training. The Zen Fire Crew is led by Joe Rawitzer, a veteran firefighter who became a student here himself two years ago. “The fire training is part of our Zen practice. It’s about centering and grounding. And remaining calm. Think clearly. Act decisively,” says Rawitzer. Fire has come to this valley several times before, and federal and state firefighters have helped protect the Center. But by the 2008 Basin Complex Fire, it became clear that the approach of state and federal agencies had become more risk adverse. “In 2008, the crews were here initially, but when the fire arrived a command decision was made at the incident management team level to pull all the firefighters. So essentially they made the decision to let Tassajara burn down,” says Rawitzer. Joe Rawitzer says that’s also the plan this time around. This is his 50th fire season. “A well trained firefighter knows to stay calm, observe the fire because the fire is telling you exactly what its doing. It’s talking to you. So when you know this, what needs to happen next is right in front of you,” says Rawitzer. And if they can’t make friends with the fire, Tassajara has some stone buildings with three foot thick walls. They can ride out the fire there.